Good Morning! This week Hilton Head Island SC, is hosting golf’s top players at the 48th Annual RBC Heritage Presented by Boeing (April 11–17). To be held at the famed Harbour Town Golf Links at Sea Pines Resort, the tournament, like the island itself, has rebounded from the depths of the Great Recession to become a magnet once again for visitors, and especially retirees. 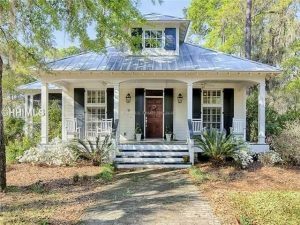 Located in the heart of Palmetto Bluff, this charming cottage is a wonderful opportunity to enjoy the resort neighborhood lifestyle. Send me more about this home in Palmetto Bluff! This 2,860-sf home is located on a private cul-de-sac with extraordinary views of Bear Lake to the rear. Spacious and open, it’s in close proximity to Dolphin Head and Plantation pool and tennis. Enjoy the easy lifestyle this golf home offers, with its flowing open floor plan ideal for entertaining. It is also designed for convenience, with multiple generous storage areas. Send me more about this home in Colleton River! Currently being built by highly regarded Osprey Construction, Inc., this 3,250-sf home is designed so that every room has prime views of Forest Lake. Several rooms can be customized to the owner’s specific preferences. This 2,883-sf Lowcountry home excellent creek and river views from throughout the residence. An enormous back deck wraps around the home amid the privacy of a handsome, well-treed property. Send me more about this home in Moss Creek! Oldfield offers you a taste of the Lowcountry lifestyle. > Oldfield, Okatie, SC Come visit Oldfield private golf and amenity community on its Discovery Package and learn about the Lowcountry life. The package is for two people who will stay in either a River Cottage or Carriage Home. Special features include lunch for two at Magnolia Grille or diner at the River Club and one round of golf for two. Other benefits include a river cruise for two with Oldfield River Pro, complimentary access to The Sports Club, Equestrian Center and Outfitter’s Center and use of kayaks and bicycles. Package also includes a VIP community tour with an Oldfield Realtor. Cost: $199/night. For more information, contact Darle Booher, Realtor, at 843-368-5549. Send me more information about Oldfield! Palmetto Dunes, SC: Ready for summer-long HarbourFest. > Palmetto Dunes, Hilton Head Island SC has preparations underway for another edition of HarbourFest at Shelter Cove Harbour. This is a summer-long celebration with live music featuring Shannon Tanner, entertainment from Cappy the Clown, art & crafts and activities for kids. Tuesday nights during HarbourFest feature fireworks displays This family-friendly event has been enjoyed by thousands of visitors for the last 25 years. Harbourtfest, runs mid-June through mid-August. Send me more information about Palmetto Dunes!